It’s interesting that mostly everyone stuck to the blackout dress code for the after parties, even if they didn’t attend the ceremony! Julianne is a longtime supporter of Marchesa – the brand co-owned by Harvey Weinstein’s ex-wife, Georgina Chapman. That’s to say, I was very curious to see who she would wear. I do not believe in blaming the wife for the sins of the husband, but I do think that Marchesa will have to go through some serious re-branding or hibernation period before they re-emerge. Lacking Marchesa as an option, Julianne went with similarly romantic, if less froofy, Jenny Packham. 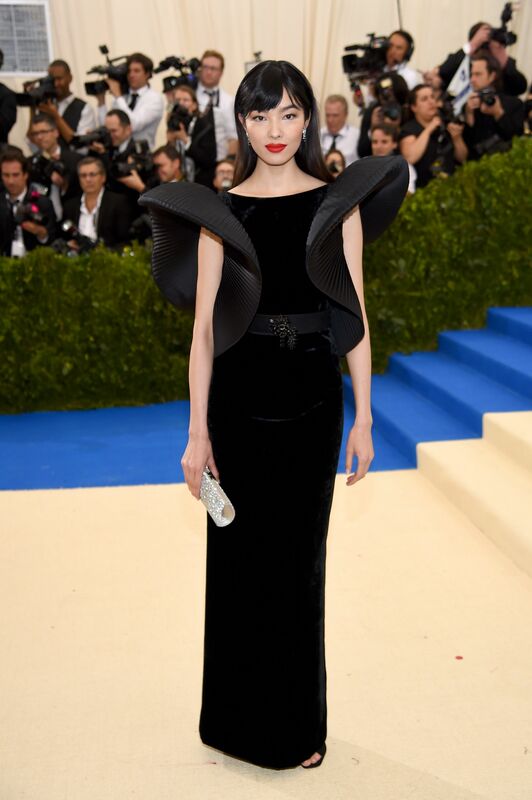 I love this dress, but Fei Fei Sun wore it to better effect at last years’ Met Gala. It was originally shown with a gorgeous embellished belt, and I don’t know why both wearers replaced or removed it? I really like this. Lhuilier has always appealed to my girly, romantic sensibilities. This is so fascinating to me – I don’t know what year this Chanel hails from, but it feels similar to recent collections (see Caitriona Balfe’s dress from the very same night). It’s always interesting the way designers return to similar ideas over the course of a career. Sometimes it’s calculated nostalgia, and other times it’s just natural aesthetic showing through. Natalia is one to watch for sure. She has really great taste and is working with good stylists and big-name brands. I’m into this. The pattern is actually little hearts! I had to look Kaitlyn up – she’s a moderately burgeoning movie star. Bravo on her for getting a pretty great Valentino. If you’re not following Kate Beckinsale on Instagram, you’re missing out. She’s an absolute riot, and has the most charmingly cool relationship with her ex Michael Sheen, and his longtime girlfriend, Sarah Silverman. I might have a little crush on her. I love this, minus the annoying sheer panel holding the neckline closed. Would be much better if it stopped where the natural V shape takes it. Another Alex Perry, who I am not particularly familiar with. Better, and more covered up, than her usual. Still not great. Something about her has always rubbed me the wrong way. There’s a self-absorption and vacuousness to her that’s just ugly. Plus, she’s a thief. Shay is one of the most effortlessly gorgeous celebrities out there and this whole look is trying way harder than it needs to. This is genuinely one of the most hideous things I’ve ever seen. This is a crime against humanity. This is way more vampy than she usually goes, but it’s working on her. It was originally shown with long, hot pink opera gloves which I am grateful she opted out of. This is super cute and youthful for a super cute and youthful star. I really don’t get it about Vera Wang. Maybe she used to be better? There was a time when she was thought of as a classic American designer, and she may technically be, but it’s been a very long time since I’ve liked anything she’s put out.